It's a wrap. A giant Noro Pompom wrap! A few months ago, my prize for being the Black Sheep Wools Blogger of the Month was some gorgeous Noro Kama (in colourway 10). I've been looking for something suitably snuggly to use it for and started to crochet an adult version of this shrug a while back, but didn't like the way the stripes were working up. The yarn was held double and I used 12mm needles, and just 20 stitches. I changed one of the yarns over before the first two balls had run out, for smoother colour transitions, and simply knitted until I was almost out of all my yarn (five balls in total), leaving just enough for the pompoms when mixed with some pink scraps I had from another project. The weight of the scarf means it has grown since coming off the needles and it's long enough for me too - if I don't wrap it around my neck, it comes to the same place on me, and I suspect it may grow further with wear. 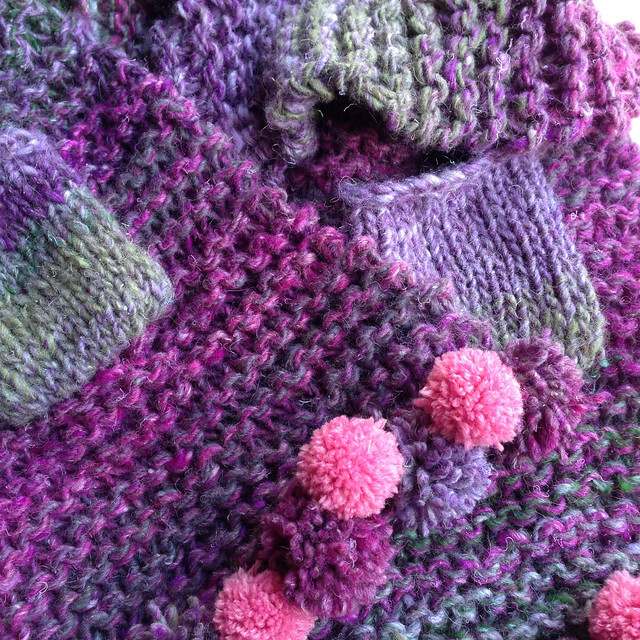 I love the way the colours worked out, and the different textures of the pompoms, garter and stocking stitches. I wish I'd thought about pockets before using up all the yarn, so I may need to make another one! In the meantime, I have to figure out a way to share it with Little Miss. * The book contains both knitting and crochet projects made with chunky yarn and big hooks/needles. The designs are simple and modern and would be perfect for a teen or 'trendy' knitter who likes the style of Wool and The Gang etc. If you like this wrap, there is a pattern for an absolutely enormous adult-sized scarf (15mm circular needles) with very large pockets, in the book. There are lots of other fun projects which would suit a similar taste too. That's a scarf with wonderful texture. 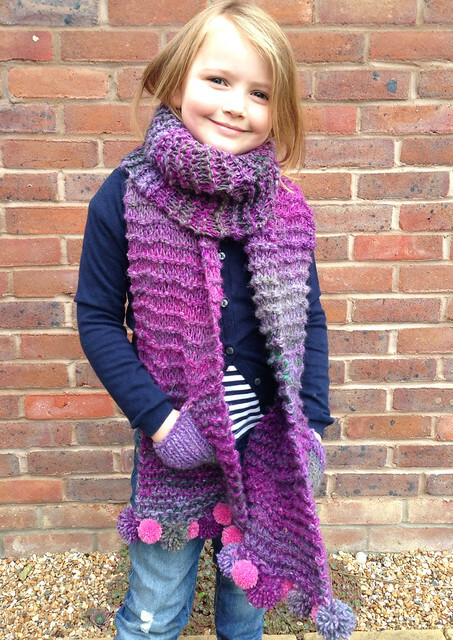 And since it doesn't take too long to make, it seems like a perfect scarf for a kid. Because you've got to know that, before the winter is over, they're going to get it dirty, put holes in it, or lose it. So you have to pick something you can get lots of hedons out of, without spending too much time. Wonderful project. I love a good, long scarf to wrap about. I seriously need to make myself one. And the pom poms at the ends are a fun and unique touch. It's just so pretty! I love the colour mix and the little pockets and the pom poms and the longer length. Perfect for the chilly weather that's not far away now! That looks one very warm and cosy scarf.